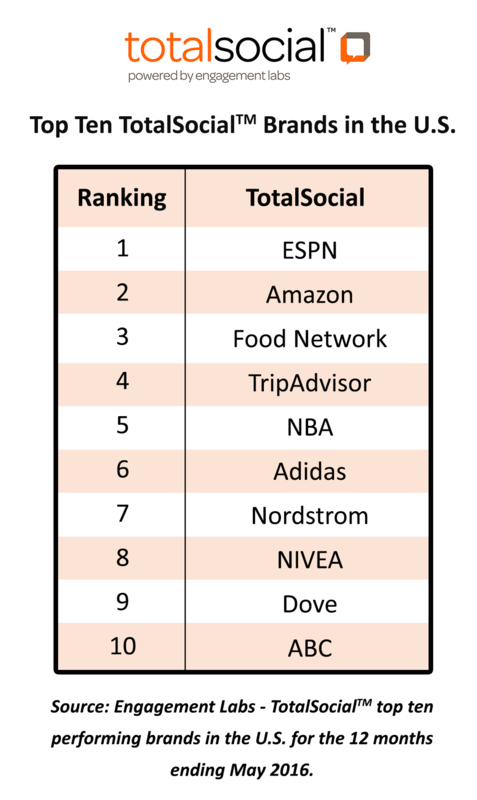 ESPN, Amazon and Nordstrom Rank Among the Top TotalSocial Brands in the U.S.
TORONTO, ON – August 9, 2016 – Consumer conversation is a proven driver of sales. In fact, word of mouth conversation is responsible for $6 trillion in annual consumer spending and is a key driver of marketing ROI. Of that, one third of the sales impact is from online conversation, while two thirds is attributed to offline conversation. Only by looking at online and offline together can you get a true picture of what consumers are saying and how it is helping or hurting a brand. To help marketers tap into the full power of consumer conversation, regardless of where they occur, technology and data company Engagement Labs, announced today the launch of a new and innovative measurement solution for brand marketers. TotalSocial is the first solution to combine in-depth social listening with comprehensive offline conversation measurement tools, delivering a TotalSocial scorecard in 17 major industry categories, plus diagnostics to guide improvement. TotalSocial uniquely shows marketers how their online conversations differ from offline conversation and helps identify areas of competitive opportunity or significant emerging threats. “At AT&T, we know that consumer conversation about our brand is an important driver of our sales. This includes real world conversations, as well as what gets talked about in social media. TotalSocial is an important evolution in consumer insights and analytics. It’s the first-ever truly integrated and comprehensive source for both offline and online consumer conversations about brands,” said Greg Pharo, Director of Market Research & Analysis at AT&T. The TotalSocial measurement solution enables brands to track and measure owned and competitor online and offline conversation performance on an ongoing basis. 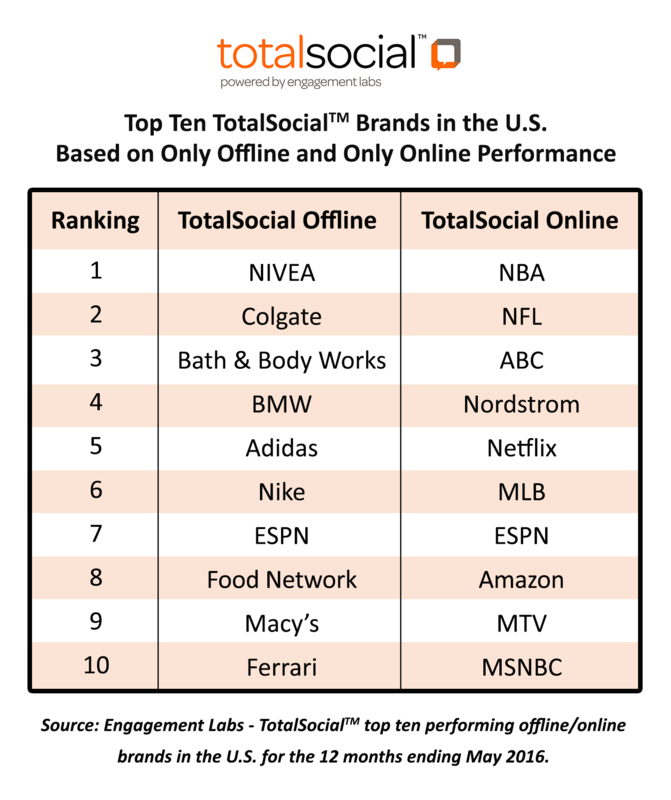 There are very few brands that are top ten performers in both online and offline channels. This demonstrates a clear need for marketers to understand where their brand performs well and where they need to apply new marketing approaches in order to drive consumer behavior to become a top performing TotalSocial brand. “What is important for marketers is that it’s not just about understanding your brand performance. It’s imperative to know how your brand performs against key competitors, as well as the industry overall. TotalSocial provides brands with detailed information into the metrics that make up a brand’s performance and identifies the right marketing levers to pull in order to improve marketing ROI and topline performance,” noted Segal. The TotalSocial measurement solution is based on a proprietary scoring system built on the pillars of Engagement Labs' patented social media measurement tool and the world's only word of mouth tracking system for brands. The TotalSocial score is based on the most important drivers of brand performance: Volume, Sentiment, Brand Sharing and Influence. As a tracking system that is "always on," momentum is built into each of the metrics. TotalSocial tracks 500 brands within the U.S. and 350 brands in the UK. If you’re interested in more information about TotalSocial you can join the Introducing TotalSocial – Make every conversation count webinar on September 13th 2016 at 2:30PM (EDT) by registering here. Or you can contact totalsocial@engagementlabs.com. Engagement Labs (TSXV:EL) is the world’s first TotalSocialTM company, offering intelligent data, analytics and insights for marketers. We are leaders in tracking, measuring and benchmarking the social impact of conversations happening around a brand and industry - both online and offline. Consumer conversations are a proven driver of critical business outcomes, including sales. Engagement Labs’ TotalSocial measurement solution provides brands with unique data fuelled insights and powerful analytics to understand online and offline social impact and drive business results.